Money bail is American exceptionalism of the wrong variety. The United States is one of just two countries worldwide (the other being The Philippines) that continues to use a system of wealth-based detention. But around the country, people are waking up to this injustice. This week, Atlanta joined cities like Chicago, Nashville, Birmingham, New Orleans, and others that have recently ended their use of wealth-based detention to jail indigent citizens awaiting trial for petty offenses. The flagrant inequality of detaining those without means – while those with means walk free – was a stain on our city’s national reputation as civil rights leader. 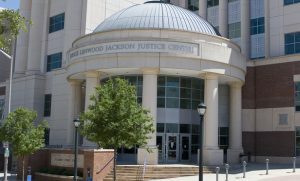 At the Southern Center for Human Rights, we’ve dealt with unconstitutional bail policies before (in 2015, we sued the City of Calhoun, Georgia for its illegal practices) and the criminalization of poverty has long been a priority issue for us. So, when local organizers and activists flagged bail reform as a priority in Atlanta, we were ready to join. We pored through jail dockets, noting the type of offense and the set bail amount, flagging the many cases where it seemed clear that an individual was being detained simply because they couldn’t afford their bail. We discovered that every night, jail cells in Atlanta are full of people who have been charged with petty offenses – like driving without a license or littering – because the city’s policy required money bail that these individuals did not have. If those same people could afford to pay their set bail, they would simply walk out of the jail and return to their jobs, families, and communities. Instead – just because they are poor – they remained behind bars. We discovered that in Atlanta, in 2016, at least 890 people were transferred from the city jail to the county jail after an inability to pay their bail. Those 890 people were detained for a combined 9,000 hours, at a cost of approximately $700,000 to taxpayers. Money bail systems that detain only low-income people devastate families and communities, overcrowd jails, lead to increased crime, cost municipalities millions of dollars in excess costs, and violate basic constitutional and human rights. There is no place for wealth-based detention in our society – and that’s what we told former Atlanta Mayor Kasim Reed when we, along with Civil Rights Corps, wrote to him in November to sound the alarm on the corrosive impacts of Atlanta’s unconstitutional money bail system, and demand a change. On September 19, 2017, Atlanta Police arrested Sean Ramsey. His crime? Mr. Ramsey was standing on the sidewalk, holding up a hand-written cardboard sign which read ‘homeless, please help.’ Charged with an Atlanta ordinance violation which bans the solicitation of rides or business by pedestrians, Ramsey was taken to the Atlanta City Detention Center. Legally, he should have been brought before a judge within 48 hours. That didn’t happen. He remained behind bars for a staggering 72 days without a hearing, simply because he could not afford the $200 bond that was set for him. He remained in jail for almost a month after the solicitor’s office had dismissed his case. As soon as we learned of his story, we filed an emergency habeas corpus petition, and Mr. Ramsey was finally released on the evening of November 29. The cost? Because one man didn’t have $200, Fulton County taxpayers paid a total of $5,558.40 to incarcerate him. The psychological impact of 72 days of incarceration on Mr. Ramsey is incalculable. In January, we filed another emergency petition, this time on behalf of Randall McCrary. Mr. McCrary was arrested at gas station on October 22, 2017, after reports that he had been yelling at customers. McCrary, who is mentally ill, was covered in feces when the police arrested him. Once in the Atlanta jail, there was no inquiry into whether or not Mr. McCrary, who receives social security payments due to mental illness, could pay the $500 bond the judge set for him. Mr. McCrary stabilized once medicated, but because he still couldn’t afford his bond, he remained behind bars. His social security payments were halted. After we filed the habeas petition, Mr. McCrary was released. An anonymous donor was moved by his story and posted his $500 bail. His case was later dismissed. Neither Mr. Ramsey nor Mr. McCrary’s cases were anomalies: Atlanta’s poorest citizens were regularly being incarcerated for petty offenses, unable to post their bail. Our attorneys visited with many people with serious mental illness who were being held in deplorable jail conditions for months on end – even up to a year – for minor violations as they awaited competency evaluations. 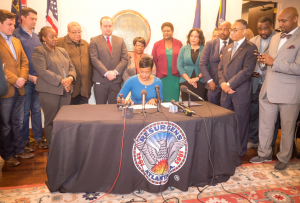 Keisha Lance Bottoms was sworn in as mayor of Atlanta on January 2, 2018. Again, we joined with Civil Rights Corps to write to Mayor Bottoms, asking her to uphold her commitment to criminal justice reform by ensuring that no one is incarcerated in the city of Atlanta simply because they can’t afford to buy their freedom. Mayor Bottoms, who has spoken movingly on her dedication to criminal justice reform in the past, answered our call. We worked with the City’s Law Department to craft an ordinance that accomplished meaningful reform; one that eliminated cash bail for most minor non-violent offenses that come before the municipal court. If someone with means can await trial at home, that same opportunity should be available to a poor person charged with the same crime. Not everyone on the City Council was immediately willing to support the ordinance. It takes a village, and we have one: our community partners and supporters contacted City Council members, showed up to votes and working meetings, and helped us spread the word about the need for bail reform. On February 5, the City Council met for over six hours to hear from community members and debate the proposed ordinance. 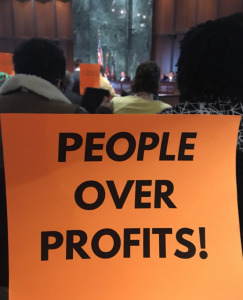 The bail bond industry showed up in force to fight to keep wealth-based detention in Atlanta. But we showed up, too. 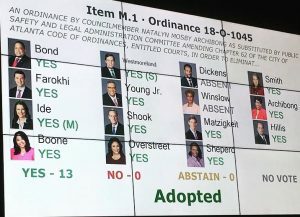 Ordinance 18-0-1045 is adopted in a unanimous vote. Mayor Keisha Lance Bottoms signs the ordinance into law. The End Money Bail Coalition was the culmination of many organizations and individuals uniting to demand change. The coalition consists of SCHR, Southerners on New Ground, Gideon’s Promise, Sankofa United Church of Christ, Davis Bozeman Law Firm, Lawyers United for a New Atlanta, SisterCARE Alliance, Concerned Black Clergy of Metropolitan Atlanta, ACLU of Georgia, Atlanta NAACP and Clayton Henry National Action Network. We were, and are, privileged to stand with them. The passage of this ordinance is a win for fairness and equality, and it gets us that much closer to ending wealth-based detention in our city for good. Read the ordinance here, and a summary here. 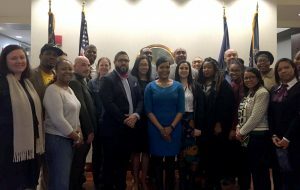 Some of the End Money Bail Coalition with Mayor Bottoms. Great work! Much of the hyperlinked text above goes to news sources that are behind paywalls so I can’t see them. Can you post links to PDFs of your letter to Mayor Bottoms and the actual ordinance? That would be enormously helpful to us in Cincinnati!